Acrylic acid and its esters such as Methyl acrylate, Ethyl acrylate, Butyl acrylate and 2-Ethylhexyl acrylate, are known as basic acrylates. Most of the acrylates are flammable, volatile and colourless liquids. The global market for crude acrylic acid was approximately 5 million metric tons in 2013, from which about 3.5 million metric tons of commodity acrylate esters are produced. The EU production capacity is currently about 1.3 million tons of crude acrylic acid and 850.000 tons of acrylate esters [CEH]. Commercial Acrylic acid is produced by selective gas phase oxidation of propene. The crude acrylic acid is further purified to obtain different acrylic acid qualities of standard or ester grade to high purity grade acrylic acid. The purity of the acrylic acid produced usually exceeds 99.5%. Acrylic acid and its esters are usually stabilised with inhibitors such as hydroquinone monomethyl ether (MeHQ). Because MeHQ is only effective in the presence of oxygen, the acrylic monomers must be stored under air or an atmosphere containing at least 5 Vol.-% of oxygen. The stabilised monomers are generally stored below 25 °C. 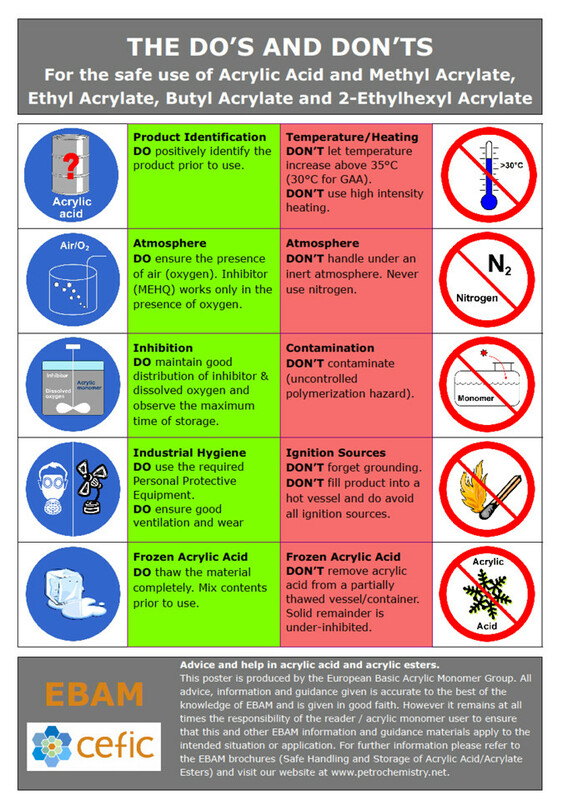 Acrylic acid should not be stored below 15 °C because acrylic acid crystallises. The primary use of acrylic acid and esters is as an intermediate in the production of polyacrylates. Polyacrylates can be produced by various processes, with emulsion polymerisation being the most important industrial polymerisation process. Polyacrylates are produced by exothermic radical polymerisation. The variety of the properties of polyacrylates and copolymers gives a large range of products, with their applications and uses. As a result, polyacrylates are used for the manufacture of polymer dispersions (coatings, paints and printing inks), adhesives, binding agents, super absorbent polymers, flocculants, detergents, varnishes, fibres and plastics, as well as chemical intermediates. EBAM is an industry association within Cefic comprising the manufacturers of acrylic acid and basic esters. The group is managed by Philippe Salemis, Sector Group Manager – tel. + 32 2 676 7436. Providing Mutual Aid in case of transport incidents involving Acrylic monomers. EBAM, based upon its members’ extensive experience in the safe handling of acrylic acid and esters, have prepared Safe Handling Guidelines for acrylic acid and the basic acrylate esters (MA, EA, BA and 2-EHA). These documents provide product stewardship advice for the safe storage, handling and use of these products. Safety Data Sheets (SDS), provided by each supplier, should be read and understood before ordering, storing and using acrylic monomers. See details in the “Relevant Studies and Literature” section. The EBAM member companies are contributing to the activities of the Acrylate REACH Task Force within the framework of the REACH Legislation by the preparation of registration dossiers and support in the evaluation process. The Industrial Emissions Directive (IED), adopted in 2010, fixes the rules for granting permits to operate industrial installations. This Framework-Directive, published in 2000, has several objectives such as preventing and reducing pollution, promoting sustainable water usage, protecting the environment, improving the state of aquatic eco-systems and reducing the effects of floods and droughts. Sustainability, also known as Sustainable Development, is a pattern of resource use that aims to meet human needs while preserving the environment so that these needs can be met not only in the present, but also for future generations. Acrylic monomers have properties that constitute key assets in terms of sustainability. In water-based paints and coatings, acrylate-based co-polymers provide good water resistance, low temperature flexibility, and excellent weathering and sunlight resistance. For construction products, acrylate chemicals offer properties such as strong adhesion, improved water resistance, ease of use, and increased durability. Some acrylate polymers also enable super-absorbency and flocculation. Finally, when used as molecular building blocks, acrylate-based monomers impart properties such as adhesion, flexibility, weather-ability, internal plasticisation, hardness control, abrasion protection, and resistance to oils and grease. Life Cycle Assessment is a methodology that allows quantifying the environmental aspects and other potential impacts associated with a product, process or service from its beginning (cradle) until its end (grave) or re-use (cradle again). The LCA procedures are part of the ISO 14000 environmental management standards under ISO 14040 and 14044. EBAM believes that LCA contributes to take more informed decisions through a better understanding of the human health and environmental impacts of products, processes and activities related to, or derived from, acrylic monomers. The EBAM member companies have joined efforts and work on widely agreeable standards concerning sustainability topics. To that effect, EBAM has established up-to-date LCA data for acrylic monomers. These results, together with the underlying methodology, are shared with other Industry organisations like Plastics Europe to ensure reliable and widely accepted sustainability data in the public domain. Beyond that, the Acrylic Monomers Industry is a strong advocate in supporting cradle-to-grave investigations for prominent application examples where acrylates prove to ultimately contribute to favourable sustainability footprint. The LCA report, together with the Environmental Product Declaration (EPD), the detailed report and the datasets, is available from the PlasticsEurope website. The International Council of Chemical Associations (ICCA) has established the GPS Chemicals Portal to provide the public with easy access to science-based, reliable information on chemicals. Easy access to information on acrylic monomers is provided via the above mentioned portal. The GPS Safety Summaries contained on the Portal provide the most relevant product safety information from companies on the chemical products they manufacture in a language that non-specialists will find easy to understand. To date, more than 3.500 GPS Safety Summaries are available on the GPS Chemicals Portal, and ICCA member companies continue to post summaries to the site. Establishing a base set of information and publishing GPS Safety Summaries for their chemicals in commerce is part of the GPS commitment of ICCA member companies – and part of the chemical industry’s commitment to transparency. EBAM has produced safe handling and storage guidelines. The purpose of these documents is to provide general information to all persons who use, handle, store, transport, or may otherwise be exposed to Acrylic Monomers and to advise on how to appropriately deal with the specific hazards, comprising health risks, flammability, the potential for untimely polymerisations and environmental risks. Safe Handling and Storage Guidelines brochures are available from the EBAM member companies and Cefic. The Do’s and Don’ts poster below was produced jointly by the EBAM member companies and Cefic. It is available in the following languages: CHN, CZ, DU, EN, FIN, FR, GER, GRE, HUN, IT, MAL, NOR, POL, POR, RUS, SP, SVK, SWE, TUR. Recommendations and Guidelines for the use of dry disconnect couplings on transportation equipment for acrylic acid, methyl acrylate, ethyl acrylate, butyl acrylates and 2-ethyl hexyl acrylate. Recommendation when using combination load deliveries by trucks or barges for the transport of acrylic acid, methyl acrylate, ethyl acrylate, butyl acrylates and 2-ethyl hexyl acrylate. Recommendation when using bulk containers (IBCs) for the transport of acrylic monomers.